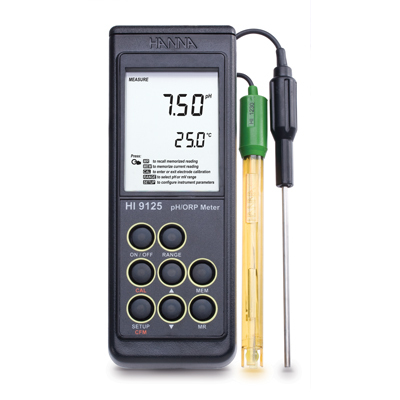 HI 8424 is one of the most popular pH meters on the market. 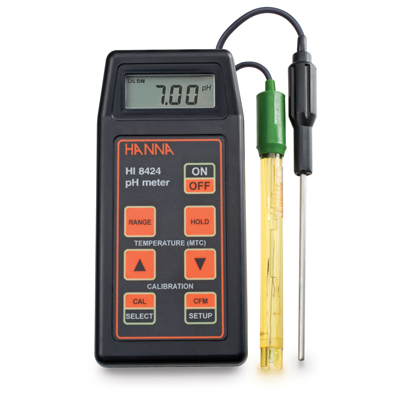 This instrument is able to perform pH, ORP and temperature measurements with a high degree of accuracy and fast response. Calibration is automatic at one or two points with three memorized buffer values (pH 4.01, pH 7.01 and pH 10.01). Once the instrument has been calibrated, the buffer values used during calibration are displayed with tags on the LCD. This feature keeps users informed of the current calibration and helps to avoid taking measurements that are out of range. Exchange the pH probe for an ORP probe to obtain ORP readings in the mV range. HI 8424 is supplied with HI 1230B pH electrode, HI 7662 temperature probe, HI 70004 pH 4.01 buffer solution sachet, HI 70007 pH 7.01 buffer solution sachet, HI 700661 electrode cleaning solution sachets (2), battery, protective case and instructions.